With an 80's theme - because, well it's supposed to be cool or something - Terra hosted a party at the Dream Nightclub in Miami on the second night of ad:tech Miami. It was crowded and everyone was dancing so it seems 80's music is good, at least, for something. There was a dude dancing on a couch, a dude dancing on a pole, beautiful people posing for shots and the ubiquitous booty shot. Oh and let's not forget the stupid "arty" shots the photographer simply had to include to somehow illustrate his photographic ineptitude. See ya next year, Miami. Learning LatAm By Osmosis: Three Different Sermons for the Price of One! Each ad:tech Miami session I've seen follows the same painful format: a moderator introduces himself, then steps aside as each panelist gives a mini-presentation. It's like watching antsy children read book reports out loud. But unlike their grade school counterparts, each presenter stretches his time allotment as long as possible. This afternoon I livetweeted ad:tech Miami's Social Media and Consumer Generated Content in Latin America: Exploring the Value Proposition. - User-centricity is the new fetish. Each panelist cited his company's user focus at outset. (Anton Chalbaud, pictured at left, emphasized Sonico's user-centricity by attesting to his company's "INSANE" focus on real people.) Gone are the days when a quick buck, whatever the means, was a virtue. - Mastering the elusive art of interactive media, especially digital, is considered crucial to taming the LatAm audience. (Especially now.) As Lucas Morea put it, "The audience is receptive." Marketers should teach users how to create and publish content. Now. On to the meat of the matter. Open power outlets are rare, and rarer still in the press room. 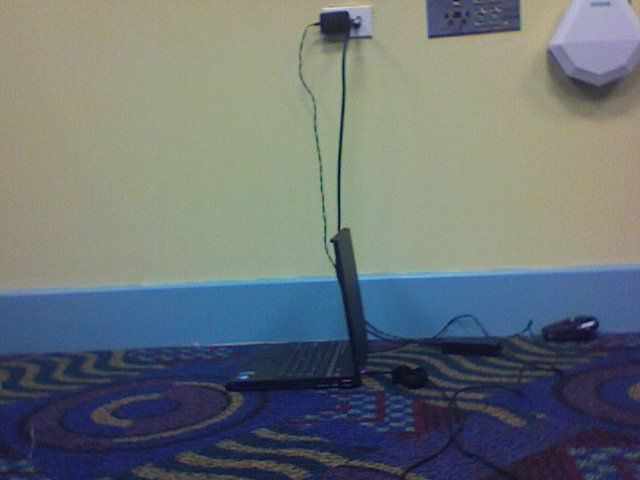 Never, ever monopolize an outlet to charge your computer and cell phone at the same time -- while you, Considerate Guy, attend sessions. After you've walked through the exhibit of just about any conference you begin to think you've seen everything. Thankfully, the intellect and sense are never let down. While the Miami ad:tech conference is a smaller conference compared to its Big Brother New York, Big Sister San Francisco and cousin Chicago, if you're not actually from somewhere in Latin America or Mexico, you feel a bit like you are in another world. OK, so it's not that extreme but it's far different than being at a New York, San Francisco or Chicago conference and in a very good way. Anyway, enough blather. On to the pictures. There was food. There was alcohol. There were lots of beautiful people. There was a pool. There were people in the pool. Drinks were dropped. Drunk-speak was the only language spoken. And then there were the...[redacted]. In the ad:tech session entitled "The Internet Economy: Start-ups, Bubbles, and Buyouts," moderated by Milbank Roy Co. LLC Managing Director Pierre-Georges Roy with panelists Global Mind CEO Marcello Montefiore, Internet Media Services Founder and CEO Gaston Taratuta, Fox Networks VP of Global Business Development Damiam Voltes and Publicitas VP of Digital Media Paul Meyer, the key takeaways were specialization and Brazil. 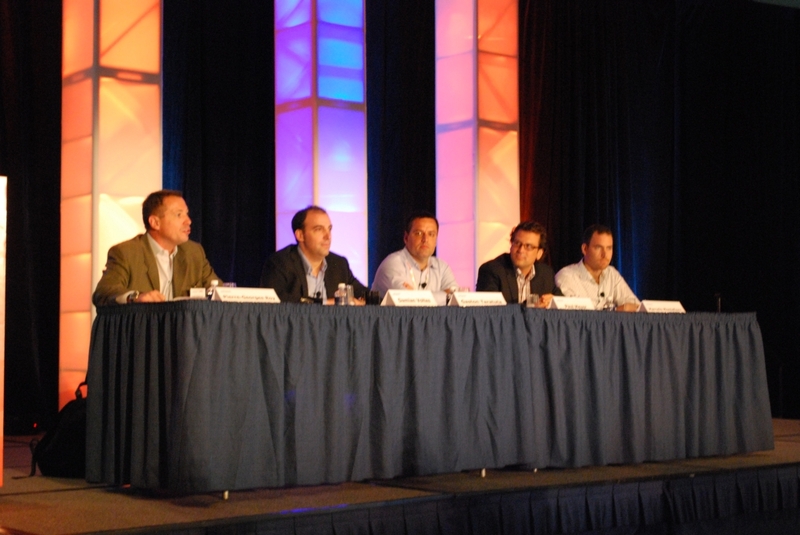 From ad:tech Miami's "Latin American Consumer Habits and Online Behavior" panel. Information was provided by CEO Fabia Juliasz of ibope/NetRatings. Use varies by age, location, cost of resources and economic status. According to Juliasz, the trick is to target them locally. Latin America consists mostly of verdant land and small communities. Cities are heavily concentrated and burdened by technology demand. This means most people in those cities can get online, but how they do it depends on what they can afford. Where users are too poor to use a computer at home, most will use public access spaces. Free wifi and internet cafes proliferate Brazilian and Peruvian cities. 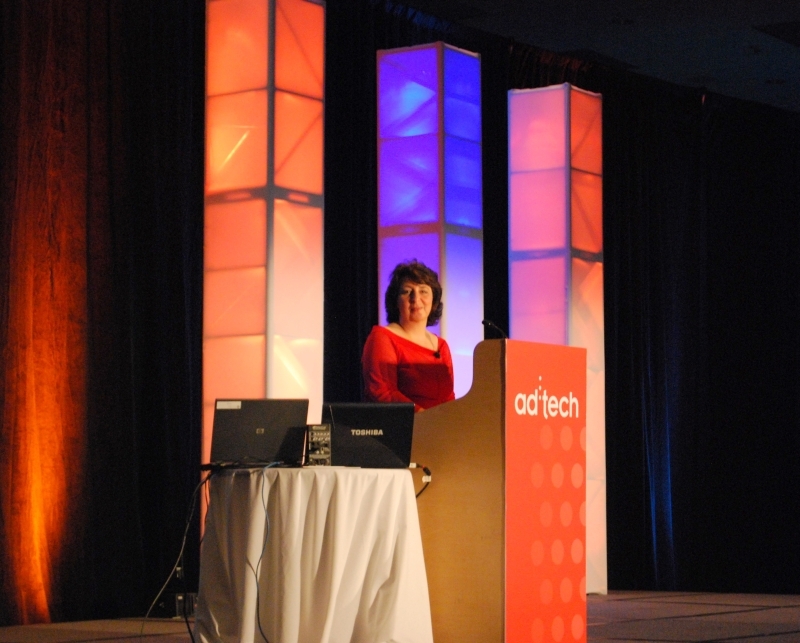 Delivering the opening keynote ay the Miami ad:tech Conference, SMG Multicultural CEO Monica Gadsby shared some findings regarding the Hispanic audience online. According to Gadsby, 19.5 million U.S. Hispanics are online, fifty percent view video (an index of 241 compared to the general market) , 70 percent of Hispanic women are online and Hispanics make up ten percent of all online users. Gadsby addressed the full house audience and focused on three areas as they relate to Hispanic marketing: Content, Targeting and Research. Beginning with content, Gadsby cited the need for more content options for Hispanics. While Hispanic content has certainly increased, more is needed and it must be easier for Hispanics to access. - Hey if shooting's your thing, Wild West Coinfest might be to your liking. It's for something. to reinvent themselves every day and stimulate their creativity. - If you're thinking about a career in coal mining, these videos might just push you over the edge...or cause you to run in the other direction. - The PSFK Conference in San Francisco, to be held July 17, is lining up some great speakers including, yes, George Parker, David Armano, Gareth Kay and Rohit Bhargava. - A trailer for an online game? Yes, indeed. Buffalo Wild Wings is debuting a new game June 2. Let's just blame the lateness of this on the hangover. Last week, Fuel Industries' Sean MacPhedran, Oddcasts's Emily Twomey and Desedo's Michael Hastings-Black hosted Rock Band Night, the first of a monthly series of parties for the advertising industry. The party was held at the home of Oddcast's president with over 100 attendees. Newscastle provided the beer. The hosts' expense account provided mixed drinks and party goers provided the music with their own Rock Band soundtracks. As they say, fun was had by all. Check out the pictures here. The location of June's party isn't set yet but as soon as it it, you'll hear about it right here on Adrants. And from the success of the first, it looks like we'll need a bigger place next time.